Each summer, Cincinnati tennis fans get fired up when one of the largest professional tournaments in the nation comes to their city. But during the winter months in the Ohio River Valley, it gets a bit too chilly for even the biggest fanatics of the sport to play at one of the area’s many outdoor tennis facilities. If you’re a tennis player in greater Cincinnati, here’s what to know about the indoor tennis courts in your neighborhood, so that you can fired up about tennis this February. The stretch of neighborhoods along the Ohio River is dotted with public parks and outdoor tennis courts, but in the winter, the Eastern Hills Indoor Tennis Club becomes a haven for players in the community. The private club has eight courts available for members to rent starting at $24 per hour. Members can also invite guests to play for an additional $7.50. The facility is open from 6 a.m. to 10 p.m. during the week, so even those who work long hours can fit a practice into their schedule. Adult teams, group lessons and junior programs make the club a perfect fit for the whole family. The quiet suburb north of Cincinnati is home to one of the area’s largest indoor tennis facilities, where players of all ages and abilities convene for tennis instruction, clinics and match play. The expansive indoor facility has 13 courts, with rates beginning at $26 per hour. Court use is available to members only, but becoming a member is affordable with the club’s pay-as you-go option. Racket sports, yoga and spinning are also amenities available to clubgoers. Early risers can get to the courts at 5 a.m. and night owls can play until 10 p.m.
Ohio’s sixth largest city has a number of indoor tennis facilities, but it’s most spacious is the Dayton Center Courts, with 10 of its namesake. The best aspect of this facility is that it offers three nine-week winter sessions for members and non-members alike. However, outside lessons and clinics, only members can rent court space. Hourly court rates start at $27 and ball machines can be rented at $31 per hour for those lacking a playing partner. Programs are available to recreational, advanced and youth players. Want to find more tennis facilities in your Cincinnati neighborhood? 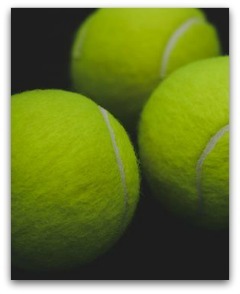 Check out the MyTennisLessons tennis court locator. Bio: Avery Shackelford writes for MyTennisLessons, the largest online marketplace for tennis instruction, which operates in Cincinnati and cities nationwide.